This little Loon caught some dinner! Add this sweet tile to your tile project to add a bit of serenity reminiscent of your favorite lake. Our tile is crafted from stoneware clay for beauty and durability. You don’t have to have the same tile as everyone else on your block! Choose Fire Creek Tile today and live in a home that is meaningful to you! This Fishing Loon 4 Inch Handcrafted Ceramic tile is sure to add a touch of wildness to your home, cabin or lake house. 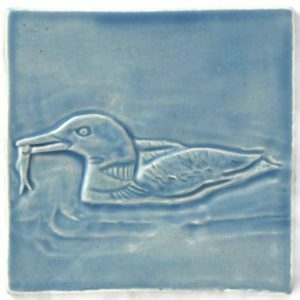 Add this sweet Loon tile to your project and reminisce about your time sitting on the shores of your favorite lake. Fire Creek tile is crafted at approximately 1/4 inch thickness to pair easily with natural stone, commercial tile and Fire Creek field tile. Each tile begins as a slab of clay, is hand carved and cast in plaster. Take a moment to read about our tile process. Fire Creek has several glazes to choose from; a variety of colors to compliment any décor. We can help you achieve the look of your dreams. Fire Creek crafts every tile just for you, so please allow 4-6 weeks for delivery. Do you still have questions? You can find answers to our most frequently asked questions here. You don’t have to have the same tile as everyone else on your street. Choose tile that is meaningful to you and choose Fire Creek Tile today!